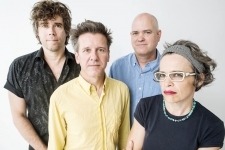 Indeed, like so much of Superchunk’s music in the band’s nearly three decades together, the songs on What a Time to Be Alive meet rage and anxiety head-on with the catharsis and exhilaration of loud punk fire and vulnerable pop energy. Like 2013’s I Hate Music, which focused on death, loss, and the role of music in an aging life, What a Time to Be Alive brings spirit to the frontlines of pain—it’s as defiant as it is despairing, as much a call to arms as a throwing up of hands. Written almost entirely between November 2016 and February 2017, What a Time to Be Alive was recorded and mixed by Beau Sorenson, who also worked on I Hate Music. The record also has more guest backing vocalists than any previous Superchunk album, including Sabrina Ellis (A Giant Dog, Sweet Spirit), Katie Crutchfield (Waxahatchee), Stephin Merritt (The Magnetic Fields), Skylar Gudasz, and David Bazan. 12/01/2015Deer Tick added to GCT15 + full schedule announced! 09/11/2014Riot Fest Chicago 2014 kicks off this weekend! 01/10/2014Ground Control Touring Artists to Play Coachella 2014! 12/12/2013Ground Control Touring Artists on Best of 2013 Lists! "Me & You & Jackie Mittoo"
"I Hate Music (Album Trailer)"